Michael Caputo, one of the icons of Minnesota Public Radio’s Public Insight Journalism initiative, and I have been talking in the past week or so about how people are paying — or not paying — their bills. On Wednesday, during the News Cut on Campus listening tour stop in Moorhead, I was set up not far from a group from a bank who were trying to sign students up for credit cards. As if paying for college was not rough enough… now that plastic in your pocket is getting into the act. Philip Novak of Minneapolis thought it made sense to put about $8,000 on his credit card. The rate was good and he needed to buy books and supplies, like a laptop, while pursuing his engineering degree at the University of Minnesota. Then he heard that Citicard’s rate was being doubled to 14 percent. For a returning student, not relying on support of parents, this is a factor that is helping to make his fifth year of school quite costly. “I’ve tried to find other cards onto which I can transfer balances, but because I’m a student with a low income, I’m having trouble qualifying for $8,000 in credit,” Novak said. He’s one of many college students getting caught up in the recent rate hikes by credit card companies. You may remember that university’s were encouraging students to use credit cards for tuition and books costs. A Minnesota State Colleges and Universities survey in 2005 on student financing said 25 percent of students use credit cards to pay part of tuition or fees… 37 percent use them for books and supplies. That’s only going up, said the MnSCU Student Association advocate Shannah Moore. The reason: Rising tuition, the cap on federal student loans and the tightening of the private credit market. In many ways, we saw this coming. In this 2004 story, MPR’s Elizabeth Stawicki called attention to the increasing role of credit cards in funding college. 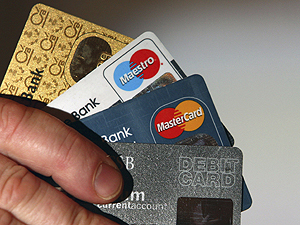 If you’re caught up in the credit card interest rate-raising, we’d love to hear from you. Please comment below. Newer › Can you exceed the speed limit to pass? I somehow got myself into the weird position of applying for my first credit card at age 30. I make $50k+ per year at my job. I never had student loans, have paid bills on time except for maybe 4 times (never for lack of funds, but merely losing things under piles of coupon fliers and the like). I just paid down a 5-year (cosigned) car loan in 2.5 years. But, my credit history is apparently blank or nearly blank, so I was rejected by the first folks I signed up with (Amazon.com card, which I believe is run by Chase). I’m trying now through HSBC where I have a bank account, so we’ll see how that goes. I’d prefer not to have a credit card, but apparently you need to have one if you ever want to own a home. I guess I’d thought that all those companies that requested my Social Security Number in order to peek into my credit history would return the favor by helping build my credit. After spending years doing everything right, building up a GREAT credit score and paying off my c/c bills in full every month, I find myself in a position to be unable to do so. I just received 2 notices telling me my interest rate was being raised – by 200% on my Capital One card, and by 100% on my Target Visa. I called Capital One, and they looked at my history and immediately reduced my rate to my previous rate until the end of the year (I hope I am making some money by then!). Target said they couldn’t do anything over the phone and told me to write a letter. I am, a letter closing the account. I paid my own way through college, with the help of student loans. By the time I was a junior, I was in need of money to pay for books, food, etc. that was not covered by earlier loans, or was outside the scope of the loans. The credit card offers plastered all over campus finally convinced me they were the answer. I think it took about 7 or 8 years AFTER college to finally get those credit card bills back under control, and paid off. It was hard to imagine I was able to pile up so much debt so quickly. Now, I still have 7 or 8 credit cards, and probably 3 or 4 lines of credit (aka credit card-like accounts), but I don’t carry a balance on ANY of them from month-to-month. I’m able to use them and pay them off each month. I figure I paid the credit card companies enough interest due to the debt I racked up in college. I wish they would ban credit card offers on campuses, it’s too easy to start down the road to debt when you’re in that position. Capitol One raised their rates for everyone. Mine was 4.99%, they want to raise it to 13.99%, Adjustable. When I called they told me most people are getting 24.99%. I have an “upper tier” credit rating. Capitol one is still better than most, because they offer the option of closing down the card and paying it off at your current rate. I took out a card with my credit union at half their rate-Fixed rat – in case I need one, and am canceling Cap 1. Too bad, they always had excellent customer service.